Arguably the most relatable aspect of family films – since their primordial beginning – is the exploration into the importance of community and home. Take a minute to think back on some of your favorites and I’d bet at least half matched that description. That’s because, as children, we’re born into the situation and the setting. Then as we grow older, as we move and change and mature, the sense of home adapts. At the heart of the latest Rudyard Kipling adaptation are two separate ventricles; one pulses with belonging and the other rapidly beats out of separation. As such, the movie brings a vitality and human emotional elements to the tale of a man cub raised in the wild. We haven’t seen the story like this before, neither have we witnessed such beautiful animated wizardry. This modern and more complex rendering brings the hand-drawn sketches of the 1967 classic to life, sweeping them from the pages and into a world as detailed and convincing as has ever been put on film. The Jungle Book holds its own, standing toe to toe with the entirety of the Disney vault. As Cinderella Castle exits from the opening credits, The Jungle Book pays homage to the animation of the original – briefly and barely discernible – before placing us among the vines and the waters. It’s a tip of the hat; a newcomer saying, “thanks old-timer, but look what I can do.” And what a damn splendor it is. Utilizing the technology of Avatar alongside most of the same crew, director Jon Favreau and his creative team of designers and artists manage to pull off the unthinkable without a single loose string. 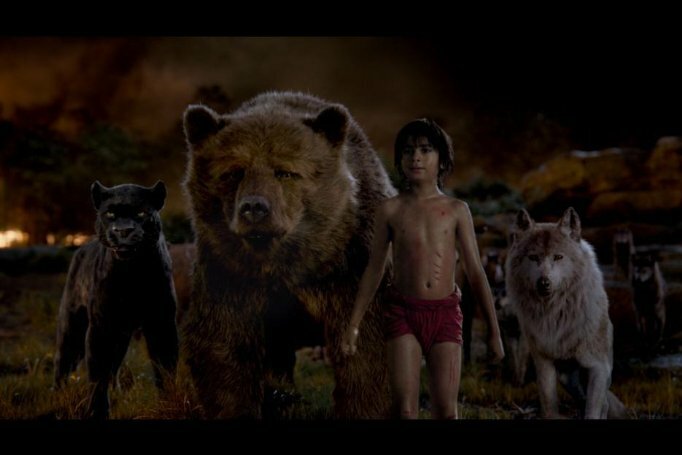 Save for acting rookie Neel Sethi in the lead role as Mowgli, nearly every inch of the screen is computer generated. This iteration is decidedly more intrigued by adventure and drama than the predecessor’s joyful whimsy. For that exact reason, because of how photo-real the animals and the environments are, we immediately suspend belief. The Jungle Book might just be the most visually arresting film I’ve ever seen. Groundbreaking effects only sink if they are guided by a story that breaks even ground. Screenwriter Justin Marks’ take on the material reveals itself piece by piece, has perfect structure and story beats, always shying away from staleness and embracing a distorted reality. Mowgli has been raised by Akela (Giancarlo Esposito), leader of the pack, and by the nurturing proxy mother Raksha (Lupita Nyong’o). 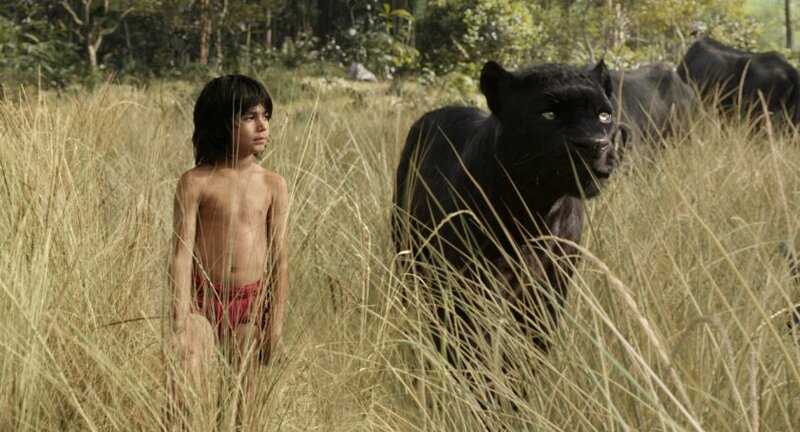 Helping to guide Mowgli is Bagheera (Ben Kingsley), the panther who found him as an abandoned infant and placed him within the pack of wolves. All of the jungle accepts Mowgli besides tiger Shere Khan (Idris Elba). He’s been scarred by man in the past, bearing the marks of the “red flower” which is known to us as fire. Shere Khan epitomizes the evil that mankind is capable of, which drives the tiger to make the wilderness come to a decision. Either they hand over the boy or he enters into a reign of killing and terror. Due to Sethi’s unfamiliarity with acting, a lot of Mowgli’s scenes go unrefined. The kid has charisma to spare and shows maturity in the final act, but he was most certainly hired for his physicality and athleticism. 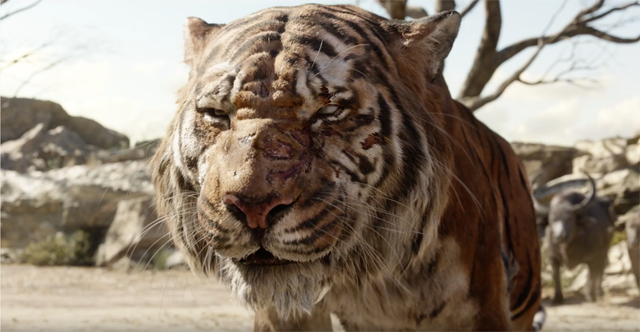 The Jungle Book this time around is action oriented, almost aimed more at adults than children, and follows Mowgli’s journey through precise direction and visionary cinematography from legend Bill Pope. I really do believe kids will find it a little too dark. Favreau juggles the tone though, going heavy before relenting to the lightness of Mowgli’s encounter with the affable Baloo (Bill Murray). Casting Murray in the role is a move of genius; he gives the film warmth. 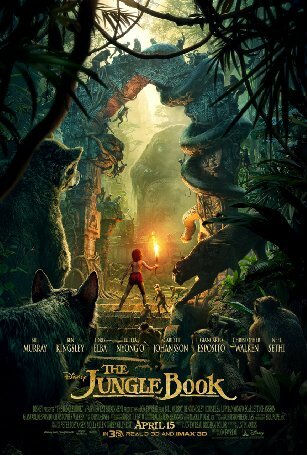 As does the entire voice cast, including Christopher Walken playing King Louie and Scarlett Johansson as the python Kaa, a storyteller of sorts who informs Mowgli of his origin. Too many animated films throw big name stars into roles simply because audiences will recognize their voices. Instead, Favreau shapes the recordings to serve the characters. What he gets out of Elba and Murray are two remarkably memorable performances. A major component of The Jungle Book deals with Mowgli’s “tricks”, or what we would call sheer inventiveness. Bagheera chastises the creativity so he appears to be more cub than man. In a turn of events, the sly and slumbering Baloo embraces the whiz kid’s ingenuity, if only to get more honey in his belly. It’s here that the film really defines itself and allows its only human character to actually be human. There’s nothing wrong with being resourceful; in fact, it can be life-saving. Which is why Favreau’s film relishes in its revolutionary approach. Everything about the CGI is Oscar worthy. The studied animal movements, the jungle’s scale and layers, the mouths of talking creatures. It’s pure zoology. Still, beneath all of the ornamentation lies depth. We get a villain with backstory and purpose. Subplots that service the story rather than being transparent or perfunctory. Honestly, I can’t say it any clearer; the movie is simply and incredibly well-done. Every child in my IMAX 3D showing (a mind-blowing ride), was shrill during the previews. Then for 90 minutes, they sat silently hypnotized, watching their imaginations come to life on the screen. 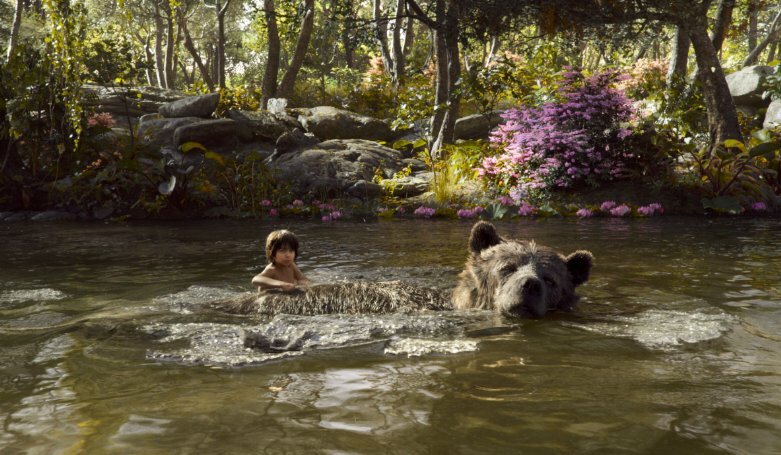 The enchantment of The Jungle Book is its engrossing wonder and the indefinable sense of awe.